Baldfaced hornets are not true hornets, but rather a species in the yellowjacket family. Balfaced hornets live in colonies similar to those of honey bees and ants. The colony is contained inside the nest constructed of paper-like material made from chewed wood fibers mixed with saliva. The nest is composed of 3 or 4 tiers of combs within a thick, multilayered outer shell. A single opening at the bottom allows the hornets to fly in and out. 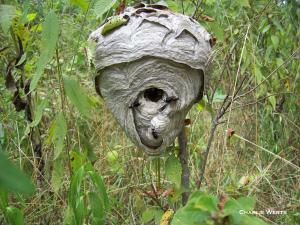 Baldfaced hornet nests are usually located in wooded areas, attached to a tree branch, but may be attached to shrubs, utility poles or house siding. Baldfaced hornets are large, black insects about 7/8 of an inch long with white to cream-colored markings on the front of the head and at the end of the abdomen. Like all wasps, bees, and ants, hornets have a complete life cycle of four stages: egg, larva, pupa and adult. The larva is a legless grub reared within cells in the nest. Hornets are beneficial predators that feed on other insects, particularly filth flies and blow flies. A colony of social wasps (hornets, yellowjackets and paper wasps) lasts only 1 year. Each nest is built from scratch each year and the previous year's nest can not be reused. Queens are the only members of the colony able to survive the winter. In April or May, each queen selects a suitable location, constructs a small nest and begins raising sterile daughter offspring. These workers take over the duties of enlarging and maintaining the nest, foraging for food and caring for the offspring while the queen functions only to produce more eggs. At first colony growth is slow, but growth increases rapidly by mid-summer as successive broods of workers emerge. Peak worker population is 100 to 400 hornets by the end of the summer. In the fall, males and new queens are produced. These leave the nest, mate, and the fertilized queens hibernate. The remainder of the workers, the old queen, and the males die of old age or freezing temperatures. The size of a hornet's nest and the hornets' reputation is often sufficient to alarm people. Fortunately, the aggressiveness of hornets does not match their appearance, although disturbing a nest or threatening an individual wasp will result in stings. Hornets are very protective of their colony and will usually attack if someone approaches within 3 feet of the nest. A nest located in a "high traffic" area such as along walks or near doorways justifies control to reduce the threat of being stung. Nests away from human activity should be left undisturbed. Baldfaced hornet colonies are relatively easy to control using one of the several insecticidal aerosol products specifically designed for this purpose. A special nozzle and propellant system spray a thin stream of insecticide up to 20 feet. Colonies should be exterminated at night, if possible when workers are least active and the maximum number are at the nest. Safety precautions include protective clothing such as a thick jacket, long pants tucked into socks, gloves, and a hat. Spray into the entrance hole at first and then thoroughly wet the nest. Do not remove the nest until all wasps are dead. This may take a day or two as some foraging workers may not have been in the nest at the time of treatment. Follow all labeled directions on the insecticide. My tomatoes are developing white or yellow areas on the sides of the fruit exposed to the sun. Why? Areas of my lawn that were covered with snow for most of the winter aren't greening up. What could be wrong?